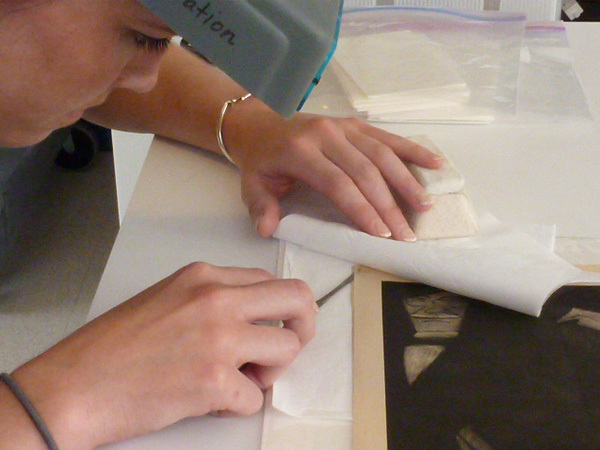 Conservators at The Phillips Collection have been getting ready for Made In The USA, the exhibition celebrating the return of the collection’s American masterworks after almost five years on tour. A few works that did not go on tour but will be featured at the Phillips this spring and summer have recently received attention to treat structural issues such as canvas distortions and insecure paint. In addition, all of the works required cleaning to remove dulling layers of surface grime. Setting down raised cracks and consolidating insecure paint on “No. 9” (1952) by Bradley Walker Tomlin. 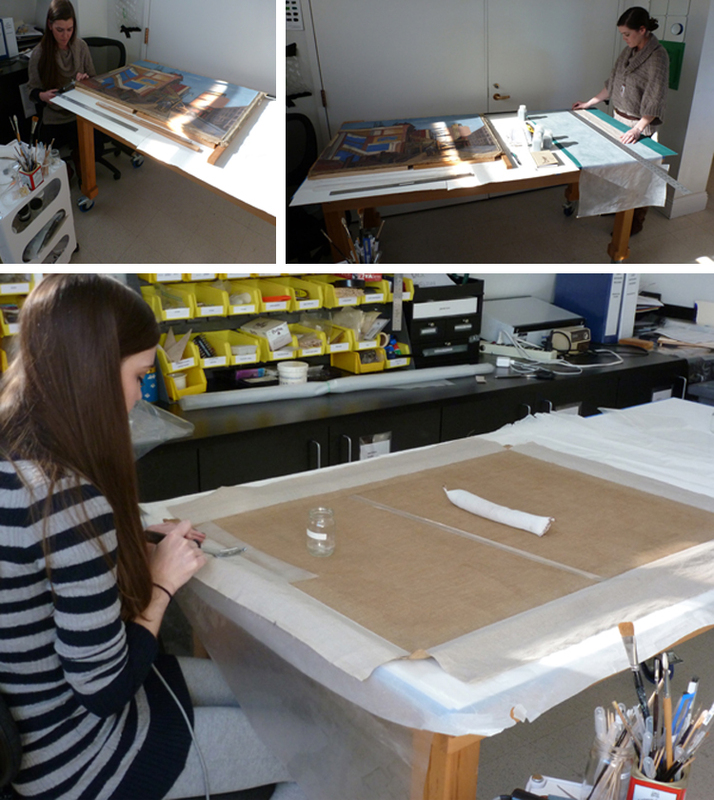 Top: The painting is raised on blocks and a suction apparatus is placed behind the canvas to aid in consolidation and drying. Bottom: Adhesive is wicked into the paint cracks using a small brush. Suction from the reverse helps pull the adhesive into the cracks as well as to pull lifting paint into plane as the adhesive dries. 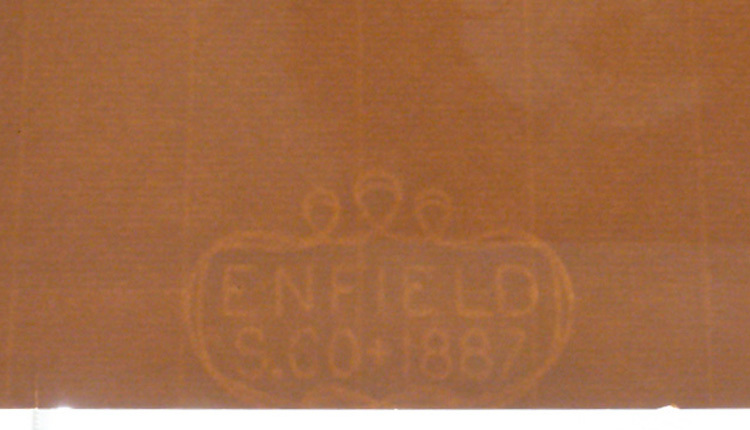 Structural treatment to reduce canvas distortions in “Fall of Old Houses” (undated) by Ernest Fiene. 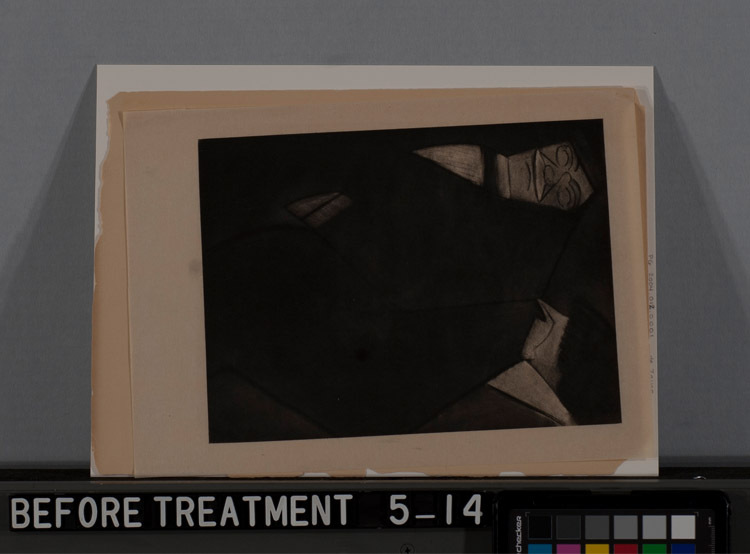 Top left: The painting is carefully removed from the stretcher and the folded over edges are flattened using controlled moisture and gentle heat from a heated spatula. 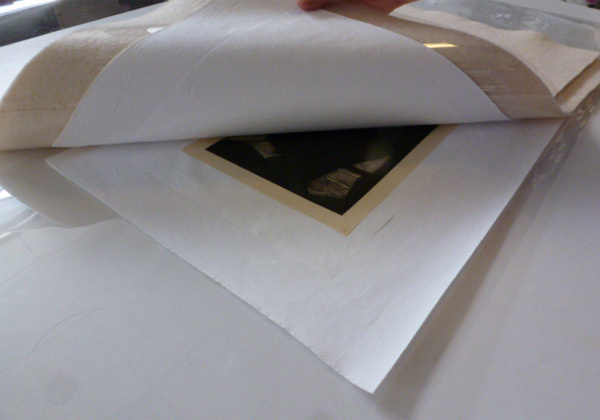 Top Right: Strips of linen canvas are prepared. 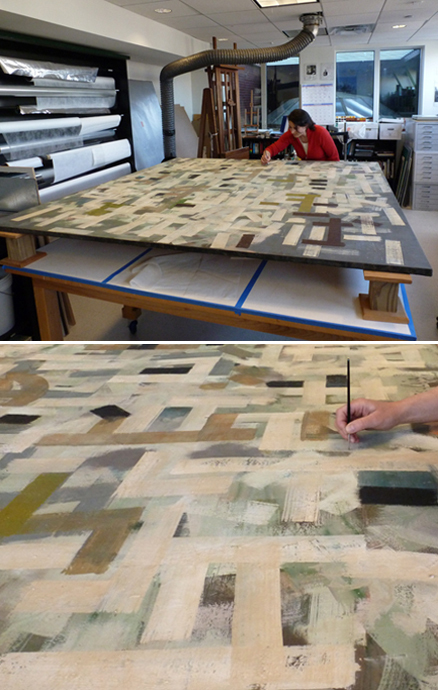 Bottom: With the painting off its stretcher and laying face-down on the table, strips of linen canvas are attached to reinforce the tacking edges. 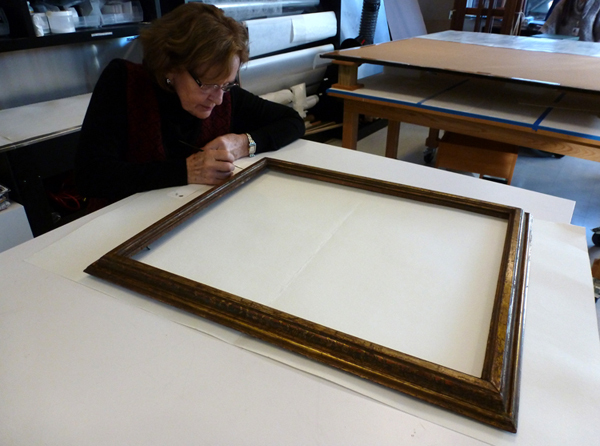 The painting will be placed in a work stretcher so that all of the canvas is accessible, and the distortions will be relaxed and reduced using controlled humidification and suction. Using a soft sponge to remove grime from the surface of “Gray Buildings” (1925) by Niles Spencer. 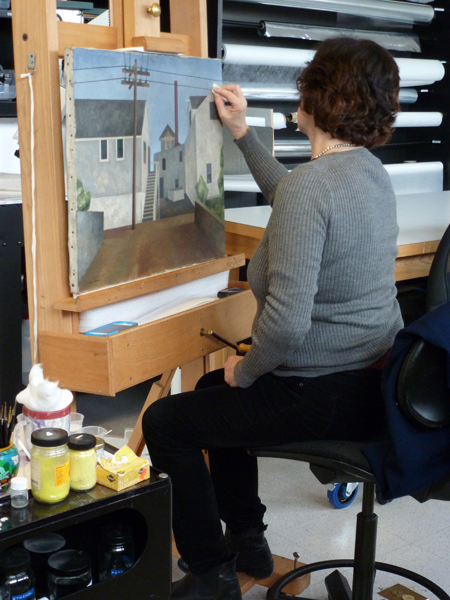 Watercolors are used to retouch minor losses on the frame for “Grey Buildings” by Niles Spencer. 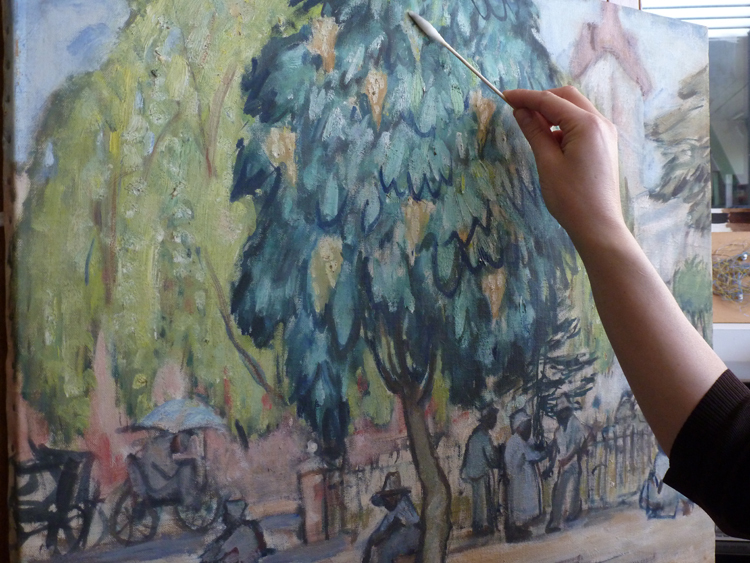 Removing dark grey grime from the unvarnished surface of “Catalpa in Bloom” (undated) by Anne Goldthwaite. 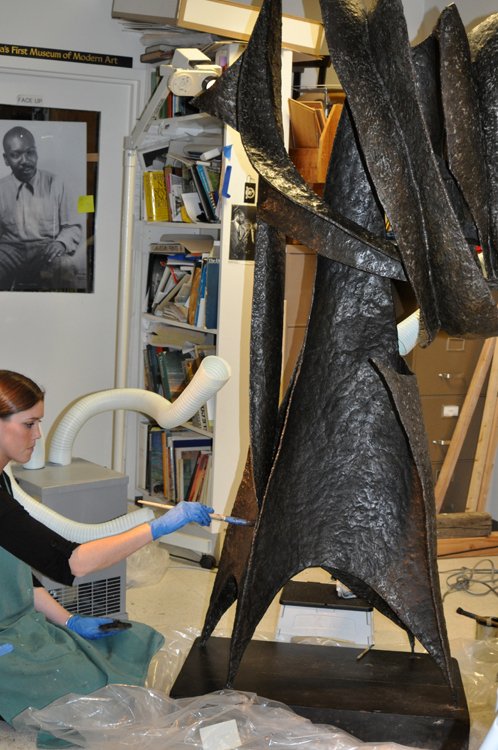 After cleaning, applying wax to the surface of “Ancestor” (1958), by Seymour Lipton.